Rumour has it that a new pig out place has been hogging the limelight in the vicinity of the Sea Park area lately. 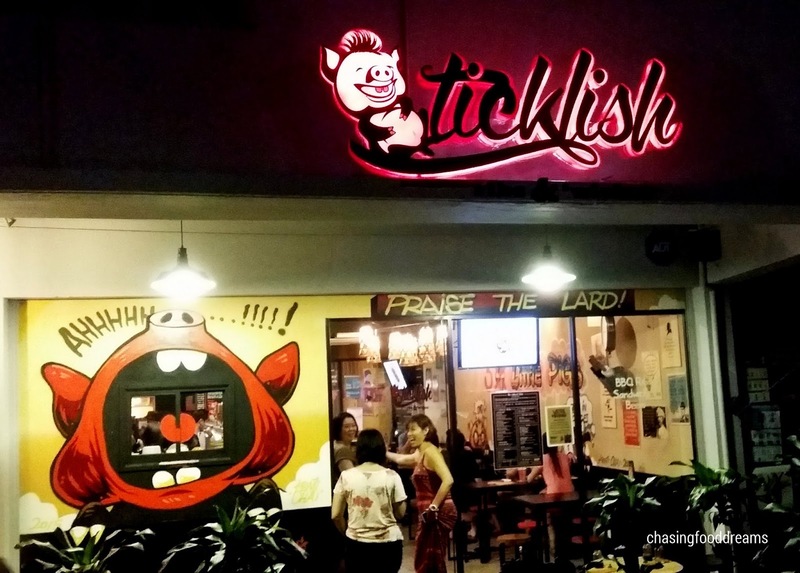 Barely open for a few months, Ticklish Ribs & ‘Wiches already has many porcine fans queuing up for a taste of their pride and joy ribs and sandwiches. Armed with a bold phrase of ‘Praise The Lard’ at their store front, it’s not unusual that many swine-crazy fans (like me!) would want a taste of Ticklish Ribs & ‘Wiches. One evening, the six swine-crazy fans hit Ticklish Ribs & ‘Wiches in hope of satisfying our constant cravings for finger-licking ribs and other porcine dishes. Located at Sea Park right on the hot spot behind the corner petrol station, parking could be a challenge but fear not, it is a known fact that foodies like us will never give up hope in search of parking for a taste of porcine haven. 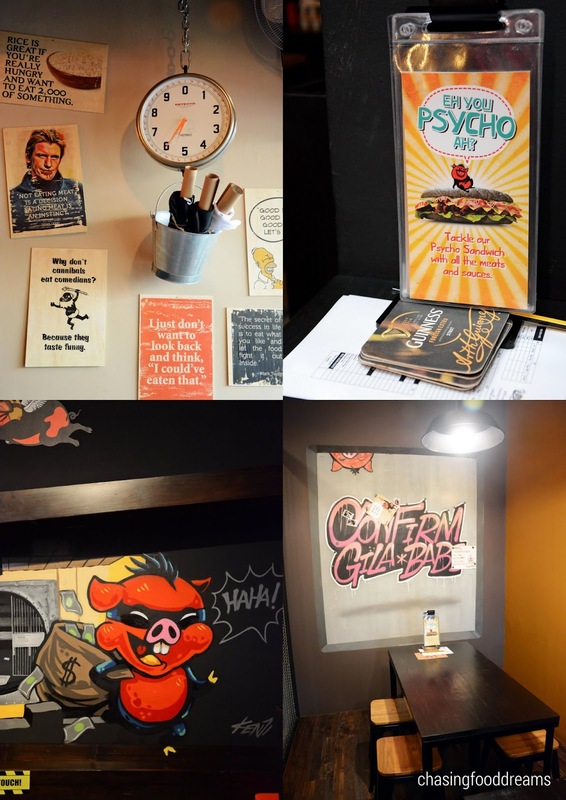 You know the team at Ticklish Ribs & ‘Wiches meant serious business because we were reminded of their ultimate porky fare at every corner of the restaurant. Lots and I mean lots of piggy photos and ornament, hog jokes and porcine idioms are splashed all over the place. They even have a super duper badass piggy icon on one of the painted mural on the wall while quite a few flying pigs were also in sight. Décor is themed in dark colors with lots of black, wood, steel and splashes of color through the paintings, posters and ornaments. Opt for regular tables and chairs or there’s always the high tables with stools for a bar like seating. Way at the back is a private enclosed area for those who may need to consume their porcine in private. The concept is self-service as diners choose what they want at the counter up front and make payment before settling down on a table. Catch actions of your ‘Wiches being prepared behind the counter or your ribs sliding down their very own pig slide from the back of the kitchen. The menu at Ticklish Ribs & ‘Wiches is tight and sufficient, with simple choices highlighting their signatures. Straight to the point, there are pork ribs, porky sandwiches and a few sides thrown in for good measure. Wash these down with sodas, coffees or beers and ciders. We tackled The Ultimate Tickle Signature BBQ Ribs with rib-tickling happiness. Available in two sizes, choose 6 ribs for RM38 or 3 ribs for RM20. There is also two choices of sauce with one Spicy or the other Not Really. Needless to say, we had both. Both sauces are somewhat similar with the only difference of one being a little spicy. I actually enjoyed both. The Spicy version only has minimal heat for a slight nudge of spiciness though I would have love more punchy heat notes. Nevertheless, the ribs are literally falling-off-the-bone tender due their cooking method of pre-boiling the ribs before finishing them on the Barbie with their signature sauces. The BBQ sauces are robust with good hits of sweet, savory, tangy and umami notes. It is definitely finger-licking good so just chuck away any cutleries you may have in mind as the ribs are simply best tackled with your fingers. We did thought of the Psycho Sandwich (RM80), a humongous hog ‘wich with all their available choices of meat and sauces piled on in one long charcoal bun but did not attempt since we prefer to taste their individual first before taking on this big hog ‘wich. 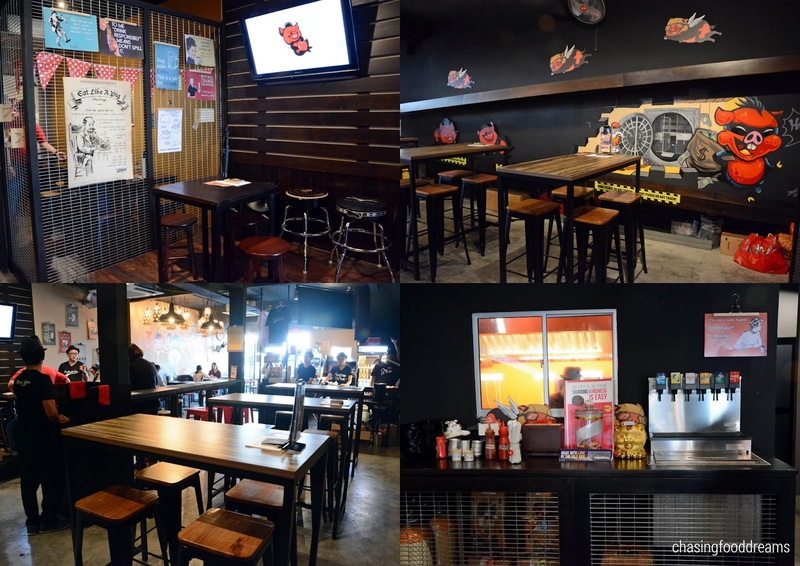 Instead, we had their You Braise Me Up (RM16), Pull Your Leg (RM16) and Got Balls? (RM13). Basically there are some options here you gotta select to create your ‘Wiches. There are 7 choices of meat from their fancy rib-tickling names of Lazy Bones (rib meat without bones), You Braise Me Up (braised pork belly loin), ChewBakkwa (Bak Kwa meat), Pull Your Leg (pulled pork) to Once You Go Black (lean pork slices), Ssshock Sendiri (battered lean pork in spicy sauce) and Hoilam Ting (pork chops in Hainanese sauce). Then select your choice of bread of Charcoal, Wholemeal or White and finally opt to have add-ons like fried egg, cheese or caramelized onions. You Braise Me Up is my favorite of the three with its sinful layers of streaky loins braised in rich sweet and savory sauce. We had ours with charcoal bread, lettuce and cucumbers. It is always heavenly when savoring pork with layers of lean and fat for that extra lusciousness of textures and flavours. We had Pull Your Leg with wholemeal bread and the usual suspects of lettuce, cucumber and onions. Its pulled pork slow cooked for hours, shredded and smothered in rich brown sauce so imagine pulled pork sandwich for this one. Got Balls? A new addition the family of ‘Wiches and we were sure pleased with this latest offspring. It’s a meatball ‘Wich with a porky twist. We had this with white bread, lettuce and caramelized onions. Smoky with little notes of sweetness and savory pleasure, meatball fans will be pleased with this ‘Wich. Then’ there’s the secret of crispy pork lard in this ‘wich that may be the justification to order this! If you cannot live on ribs or ‘wiches alone, here’s two more sides of Oodles of Noodles (RM12) or Rice Vice (RM12). Both are mediocre carb fillers. Oodles of Noodles is spaghetti with porky Bolognese sauce and Rice Vice is a version of Japanese inspired Katsudon of crispy panko-crumbed pork with rice and sauce. Freaky Fries (RM5) had golden fries smothered with pork Bolognese and cheese sauces. I would have just preferred fries with the cheese sauce as the pork Bolognese sauce was too salty for my likings. Let’s All Keep Calm & Makan Babi!